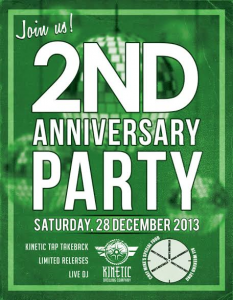 We had the pleasure of visiting both of Lancaster’s breweries this weekend and discovered that one of them — Kinetic Brewing Company — is celebrating its second anniversary this Saturday (December 28). The brewery will be celebrating all day with food specials and a tap takeback. 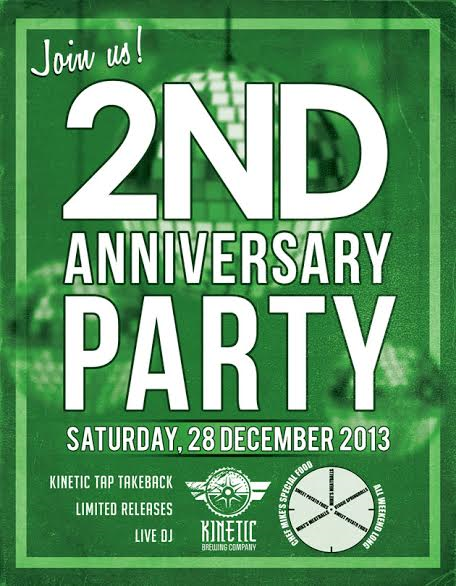 That’s right…28 taps of nothing but Kinetic brews. The brewery is also selling tickets for its New Year’s Eve celebration. Still haven’t gotten a gift for that beer lover on your list? Taste of Brews has come to your rescue with a buy-one-get-one-half-price deals for all its 2014 events. A Twilight Tasting event will take place March 8 at Lyon Air Museum in Santa Ana; the Inland Empire event will take place April 19 at Crossroads Riverview Park in Corona; and the Long Beach event will be August 23 at Lighthouse Park. The BOGOHP deals are good through December 31. I was at Torrance’s Smog City Brewing Co., over the weekend partaking in the brewery’s latest limited edition beer, a cherrywood smoked porter. It is, by the way, an excellent winter warmer perfect for a late Sunday afternoon with the chill of the evening closing in. And if you’re a porter fan, then Smog City is the place for you at noon Dec. 28. The brewery rapidly becoming known as being the most adventurous in the county will host its first-ever “Battle of the Cask,’ a friendly competition among its beer-making employees. Each edition will feature different variations on the same style of beer and first up is a porter. Fruit and Maple cask that contains dried orange cranberries and maple syrup. Peanut butter and chocolate cask that includes dried peanut butter and cocoa nibs. Mint chocolate cask suffused with chocolate powder, cocoa nibs, mint oil and vanilla beans. Toasted coconut cask containing toasted coconut and vanilla beans. Is your mouth watering? Mine, too. Local breweries are pitching in to help the less fortunate this holiday season. We’ve spotted a few around Southern California that are collecting food and toys, and offering incentives to help sweeten the pot. Chino’s I & I Brewing, for instance, has set up a Spark of Love toy collection box in its tasting room. Those who donate an unwrapped toy worth at least $10 will get $1 off pints for the night. Their campaign runs through next Saturday (December 21), so get to the toy store and stock up! I & I Brewing is at 14175 Telephone Ave., Suite J. Want to buy a South Bay gastropub? 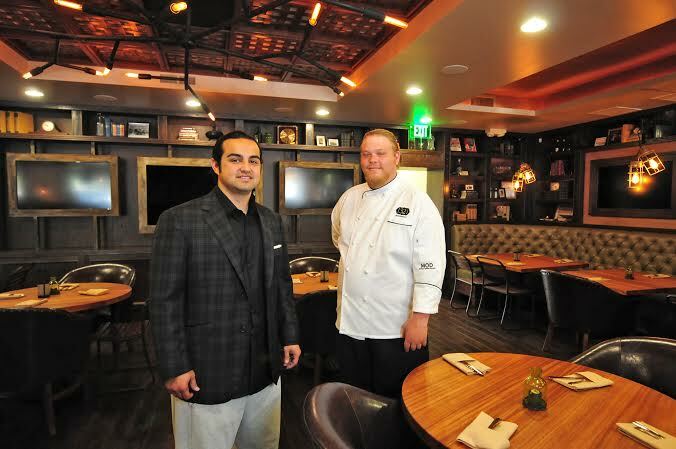 When Steve Rodriguez, left, opened the 1321 Taproom Bistro in Old Torrance in spring 2011, locals hoped it signaled not only a milestone in the redevelopment of the business district, but a sign the craft beer movement in the South Bay now had culinary pretensions to match the aspirations of its brewers. Sadly, it proved a false dawn. The new chef quickly departed and the restaurant became notorious for its relatively high prices, hit and miss cuisine and strange layout and decor. This writer personally had the worst BLT and then Caesar salad in my entire life (fool me once, shame on you, fool me twice … you get the idea). Also, guests had to walk through the entire (vast) dining room to reach the bar where you were greeted by uncomfortable stools designed that way to ensure bar flies didn’t linger (they needn’t have worried with that food). The restaurant staggered on until recently when even the lure of $3 locally brewed craft brews on a Monday night couldn’t draw in the wary. Now that’s a sure sign of its impending demise. On the plus side 1321 had a welcoming woody decor and a cool massive mural celebrating the history of Torrance in the bar. And now, in an apparent effort to recoup the hundreds of thousands of dollars the owners surely plowed into the huge, old building, it’s up for sale at an asking price of $3.5 million. There’s a market for craft beer in Old Torrance. Tortilla Cantina just down the street serves around 40 draft brews, for instance. The difference between that restaurant and 1321? Decent, moderately-priced food. Redlands’ Hangar 24 Craft Brewery will celebrate its barrel-aged brews during its second annual Pugachev’s Barrel-Aged Beer Festival on Saturday (December 7). You can call it the Pugafest for short. The event will take place from 11 a.m. to 4 p.m. at the brewery. However, those who have achieved bronze level or higher in the brewery’s Frequent Flyer loyalty program can begin sampling at 10 a.m. Cost is $25 for eight samples. Beer lovers will have 24 different barrel-aged beers from which to choose.